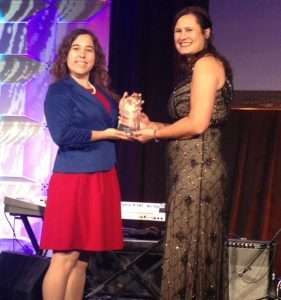 Elizabeth (Cloos) Dreyer, BSEE 2012, was selected SWE Outstanding Collegiate Member by the Society of Women Engineers for outstanding contribution to SWE, the engineering community and their campus. Dreyer was honored at the WE16 conference held in Philadelphia, PA this past week. Elizabeth is an electrical engineering PhD candidate at University of Michigan. The ECE Department at Michigan Tech congratulates Elizabeth for this well-deserved recognition!